New to Laser Advantage, Fractora™ skin treatment is a fractional rejuvenation and resurfacing treatment that reduces wrinkles to slow the effects of aging and restores skin to its youthful appearance. Fractora™ lets you look and feel younger. 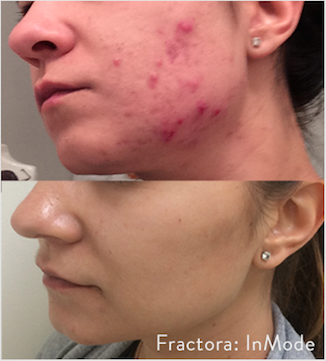 Fractora™ can be used on any areas that can benefit from skin renewal. The most common treated areas include: lower eyelid, upper eyelid, smile lines, forehead, cheeks, mouth and neck. Face and body areas that exhibit wrinkles, discolouration or acne scarring are suitable for treatment. Fractora™ gallery illustrate results following the provision of Fractora™. The pictures may display the Before & After results obtained when treatments were performed at clinics other than Laser Advantage. In providing the photos and statements on this website, Laser Advantage and the website ssmlaseradvantage.com does not state or imply any guarantee. Visible results can be seen almost immediately, with the most noticeable results typically appearing after two weeks. Improvements continue up to three months after treatment. Think you might be a candidate for Fractora? Book a free consultation today at Laser Advantage. Can this be used in combination with other skin treatments? Yes, Fractora™ can be used in the same treatment session, or a few days after other treatments. Fractora™ can also be combined with additional energy treatments or injectables to achieve a more extensive full face result, called a Fracotal Facial.